We invite you to explore India - the Land with infinite beauty ! Whether you soar high into Himalayas or peer under the ruins of the Ancient monuments dotting the landscape of India, you will cherish the experience long after your visit ! This India Travel Guide on Kedarnath is free from any commercial interest! This site is dedicated to promote India - the vast subcontinent, its glorious past, magnificent landscape and its infinite variety. The third leg of the Char Dham is at this remote holy town set in the midst of the Himalayan Mountains. The river Mandakini runs nearby. The shrine here is dedicated to Lord Shiva. The Kedarnath temple is believed to be a place where one can truly reach out to the Almighty owing to its secluded setting. Amidst the snow-capped mountain peaks, nestled beside the river Mandakini, you can find the holy temple at Kedarnath, a trek of 14 km from Gaurikund. Kedar means 'powerful' and is a name used to describe Lord Shiva. Kedarnath is close to the Indo-China border on the Garhwal Range and is the most remote among the Char Dham. Pilgrims need to trek on foot or take horses or palanquins from Gaurikund. Recently helicopter services have been introduced from Agastyamuni and Phata. Gaurikund is nearly 75 km from Rudraprayag. It has a temple dedicated to Goddess Gowri and has thermal springs that are said to have medicinal properties. Pilgrims travelling to Kedarnath can also visit other shrines devoted to Lord Shiva in the Chamoli region. In the Garhwal region, you can find the other 4 Kedars - Madmaheswar, Tungnath, Rudranath and Kalpeshwar. Together with Kedarnath, they are referred to as the Panch Kedar. Travelers to Kedarnath can also take the opportunity to visit some of the most picturesque locales in the region. Chopta, located on the Gopeshwar Ukhimath road offers breathtaking views of the snow-capped ranges. Sonprayag is the confluence of the rivers Mandakini and Son Ganga. You can travel to Vasuki Tal - a lake located at nearly 4100 mts amidst the majestic mountains, especially the Chaukhamba peak. The temple at Kedarnath stands tall since more than 1000 years. Built with heavy stones, there is a conical rock formation within the temple that embodies Lord Shiva in Sadashiva form. 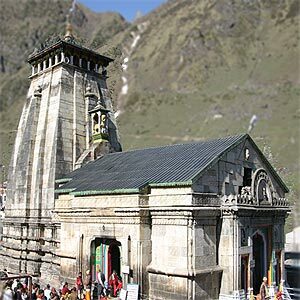 Built in the 8th century by Adi Shankaracharya, the present-day temple at Kedarnath stands next to the older temple − said to be built by the Pandavas. The exquisite architecture can be seen in the inner walls of the assembly. Depicted on the inner walls are scenes from mythology. You will find the Nandi Bull on guard outside the Kedarnath Temple door. This shrine is considered one of the 12 'Jyotirlingas' of Lord Shiva. The water of the Udak Kund found at Kedarnath is considered to be ideal for purification rituals. It is said to be the mixture of the all 5 Oceans. The temple is submerged in snow during winters. Usually the temple at Kedarnath opens around mid-May (Akshaya Trithiya) after closing on Yama Dwitiya, after Diwali day.